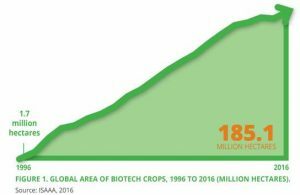 About 185.1 million hectares of biotech crops were planted by approximately 18 million farmers in 26 countries in the year 2016 which was about the 21st year of commercialization of biotech crops. From the initial planting of 1.7 million hectares when the first biotech crop was commercialized in 1996, the 185.1 million hectares planted in 2016 indicates approximately 110-fold increase. Thus, biotech crops are considered as the fastest adopted crop technology in the history of modern agriculture. In the past five years, developing countries have planted more biotech crops than the industrial countries. A total of 19 developing countries planted 54% (99.6 million hectares) of the global biotech hectares in 2016, while 7 industrial countries took the 46% (85.5 million hectares) share. It is expected that this trend will continue due to the increasing number of countries in the southern hemisphere adopting biotech crops. No wonder, the President of the Republic of Uganda H.E. Yoweri Kaguta Museveni, was quoted as saying that ‘’Agriculture is the sector upon which the success of sub-Saharan Africa’s ambition for a steady economic growth rests and our efforts must begin by strengthening investments in breakthrough technologies, such as climate resilient and disease resistant crops and livestock using both conventional and genetically engineered approaches”. “Modern biotechnology is working elsewhere and we should not be left behind, the way we missed out on the green revolution that delivered food security to South East Asia’’, he concluded. The President of Uganda reiterated that scientific, technological and innovation advancements are crucial precursors for industrialization and socio- economic development in Africa and called upon African states to embrace the use of agricultural biotechnology to transform agriculture and enhance food security. The statements of wisdom from President Museveni notwithstanding, controversies over Genetically Modified technologies (GM) in Africa still exists, about control of agricultural technologies. The absence of an African consensus and strategic approaches to address emerging biotechnology and biosafety issues have allowed different interest groups to exploit uncertainty in policymaking, regardless of the objective situation for Africa. African governments find themselves juxtaposed between the opponents and proponents of the technology. There is uncertainty and confusion in many of the African governments’ responses to a wide range of health, social, environmental and economic issues associated with the regulation and application of modern biotechnology in agricultural practice, especially in Nigeria. Despite the clear link between agricultural productivity and malnourishment, some African countries are reluctant to approve genetically modified crops. 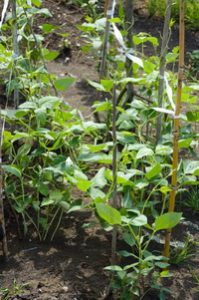 A number of new crops, like cowpea (vigna unguiculata L.Walp) commonly referred to as beans; have been developed to address important traits of relevance to both smallholder farmers and consumers in Africa. However, various social and political considerations have caused scientifically unjustified delays in the approval process of these crops. Such delays often result in the bizarre situation where technologies that both increase consumer and producer surplus, with the potentials of significantly decreasing malnutrition, fail to reach the market. These delays are costly and the effects on malnutrition can sometimes exceed the effects on producer and consumer surplus, especially for the case of cowpea which is a protein-rich crop as well as high energy content. The costs of the crops considering its adoption over time and the foregone benefits caused by a delay in approval under irreversibility and uncertainty have been studied. The costs of a delay can be substantial: e.g. a one year delay in approval of the pod-borer resistant cowpea in Nigeria will cost the country about 33 million USD to 46 million USD and between 100 and 3,000 lives. This proves that in countries where malnutrition is important, the effects of genetically engineered GE crops and other yield increasing strategies deserve attention, so that their economic and humanitarian effects are not underestimated. It should be noted that more than ten per cent of stunted children worldwide live in African countries and Nigeria has the worst situation with more than 11 million stunted children, followed by Kenya and Uganda. Cowpea is an annual herbaceous legume considered the most important food grain legume in the dry Savannahs of tropical Africa where it is grown on more than 12.7 million hectares. Africa accounts for about 65% of the world’s cowpea production. About 20 million people in Africa consume the crop which is rich in quality protein and energy content almost equal to that of cereal grains. Cowpea is also a good source of fodder for livestock and provides cash income. Nigeria is the largest producer and consumer of cowpea in the world. About 5 million of the 12.76 million hectares of land are devoted to cowpea which is grown mainly by women. Cowpea is one of the most important indigenous African legumes in Nigeria due to its ability to grow in drought-prone areas. 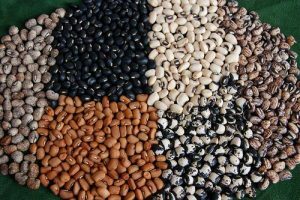 Nevertheless, many biotic and abiotic factors significantly reduce cowpea productivity in the traditional Africa farming system. Among these constraints is the pod-borer; Maruca vitrata which is the major Lepidopteran pest that inflicts severe damage to the cowpea plant. 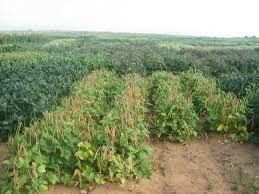 It damages the cowpea pods in the field and in severe infestations amounted to yield losses of about 80%. Control through spraying with insecticides has not been widely adopted by farmers due to its prohibitive cost and health hazards. This contributed to the ‘’Pod-bearer Resistant Cowpea Project’’ initiative, whose aim is to is to develop and disseminate farmers preferred and locally adapted Maruca resistant cowpea varieties in sub-Saharan Africa. The Pod-bearer Resistant Cowpea Project has been designed to promote technological interventions that will optimise cowpea productivity and utilization and provide farmers with an alternative to costly and hazardous insecticide spraying. It entails transferring the Bt. Gene which confers resistance to the pod of the improved cowpea varieties and this method is consistent with international standard. It is being implemented in the sub-Saharan Africa which includes Burkina Faso, Ghana and Nigeria. This project is being developed in Africa by African scientists in public institutions and not by biotech companies. The research in Benin, Niger, and Nigeria to develop cowpea resistant to pod borers started in 2008. Confined field trials have commenced and it is expected that seeds will be available for farmers by 2017, subject to approval from regulatory agencies. Fortunately, optimal conditions for approval incorporate parameters of the stochastic processes governing the dynamics of risk. The Nigeria Bt. cowpea (Bean) has being on the experimental confined field since 2009. It has undergone multiplication trial for gene stability in other ecological zones and presently under demonstration fields for farmers to appreciate its performance. 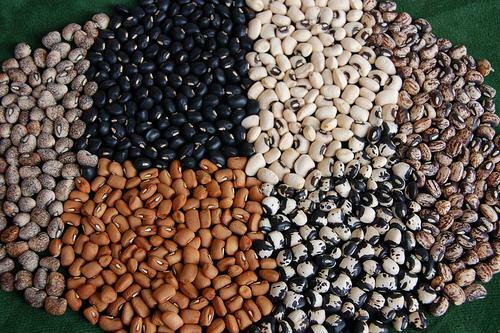 The Nigerian cowpea project no doubt, could be used as a model for other West African nations. The new varieties are expected to improve nutrition and food security for over 8 million farmers and their families. The use of improved varieties is also expected to contribute to improved health, environment and income as the need for frequent spraying with insecticide will be drastically reduced. Unfortunately, despite these laudable research findings and expectations, there still exist some flimsy arguments and erroneous claims in Nigeria from opponents of the technology, with the intention of implicating the technology to toxicity of human liver cells and damage to blood cells, kidney, spleen and adrenal gland. They also doubt the need for increased demand for human consumption and for generating income and claim that this product has been globally rejected. I wish to reiterate at this juncture, that the crop is indigenous with a very high consumption rate in Nigeria. Besides, there is no reliable data from any study on health or environment that has so far been linked to the use of biotechnology food products. These are mere speculations and perceptions aimed at disrupting the adoption and commercialization of the Pod-borer resistant cowpea together with any genetically modified food product. There are also few molecular concerns over the safe use of synthetically manufactured cry2Ab2 and cry1Ac genes in modifications. Research findings have revealed that Cry Proteins are produced by Bacillus thuringiences, bacteria that dwells freely in the soil and are found harmless in the guts of man and livestock. Members of this genus are widely used as sources of industrial enzymes, fine biochemical, antibiotics and insecticides including application in agricultural and industrial activities. These uncertainties ease the opponents’ success in delaying approval compared to the proponents’ efforts at speeding up the approval process. Significantly, delay in commercialization of biotech crops in Africa is costly; not only economically, but also in health and nutrition as it amplifies malnutrition. Regrettably, have noted that unjustified delays in approving biotech crops take thousands of lives as it not only reduces consumer and producer surplus of households but it also costs human lives. As crop biotechnology faces the third decade of commercialization, wide acceptance and innovations are expected to transform the development of biotech crops and traits. This is the new generation of biotech crops, manifested by the increasing use of stacked traits, which does not only address farmers’ concerns but also consumers’ preference and nutritional need. There is also amplified use of gene discovery in crop improvement and development of new varieties. Through the efforts of our researchers, together with conducive and harmonized regulations, crop biotechnology innovations can help double food production to address the needs of the growing global population, especially those in the developing countries like Nigeria. For opponents of the technology, announcing uncertainty about the GE crops shortly before decisions are to be made about them can be an effective tool for delaying their introduction. They have adopted this strategy and other critical steps against the Nigeria interest. The Nigeria Government should make bold to checkmate these excesses through surveillance by engaging the appropriate established institutions, if our food systems must be sufficient and sustainable by the year 2030. The time is most appropriate and auspicious now to give final official endorsement for ‘’pod-bearer resistant cowpea’’ in Nigeria.